Not my first compo but first LD entry. This Ludum Dare had two themes because of vote tie. 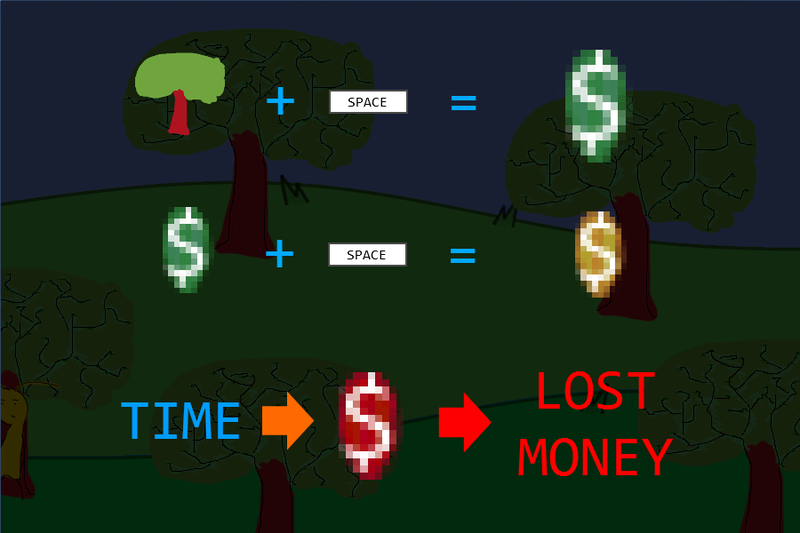 This Post Mortem was originally posted on Ludum Dare website. 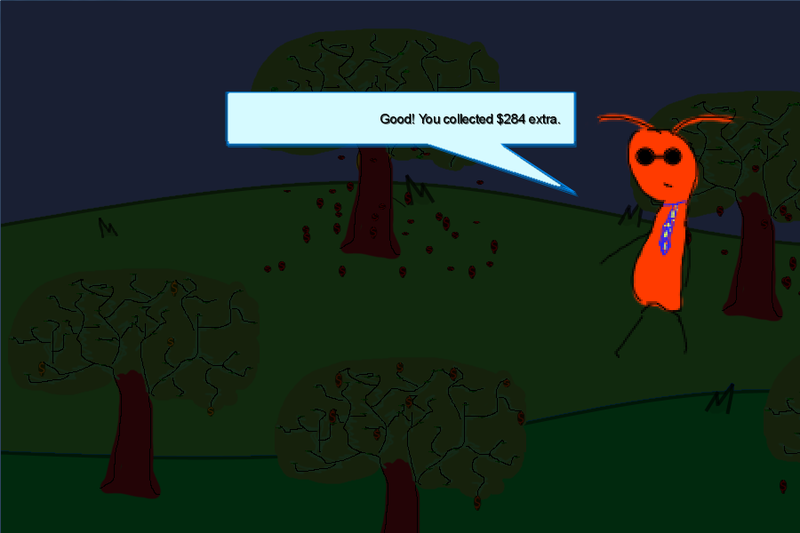 Play My Game on the Website! My first LD entry. So, basically I started with empty head. I disliked the Two Button Controls theme because it's too wide about stories so I put my efforts into the second one - Growing. I asked myself for a lots of features but I started with actually no framework at all so I ended up with only the core mechanic and "story". My game is about Jay who just got a new job. His task is to collect fruits - but those are special fruits! Money grow on trees. Business man allows to take Jay the extra cash. The little meaning of title reveals in the New Game +. I planned to do more about it but... read the rest of post mortem. And: you run out of time and have to collect enough money leafs to win the level - but I suppose this fact is pretty easy to guess. Overall, there are 4 levels. 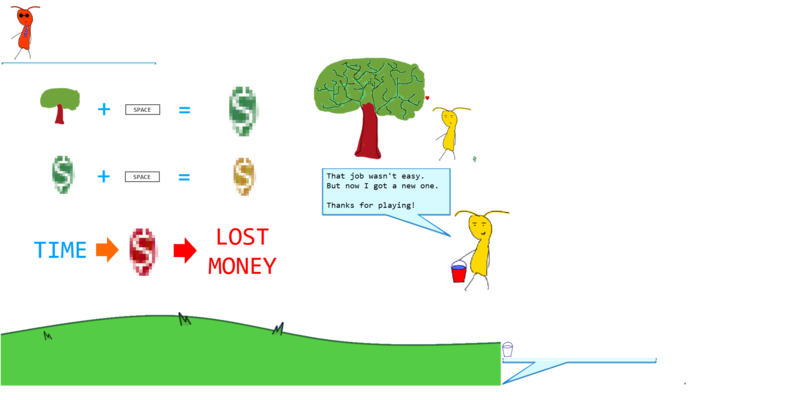 Some say that first level is very hard it actually teaches you what you're waiting for in the game mechanics (tip: you're waiting for well grown leafs to collect them). What I probably did wrong was to make player go to first level every time he loses. In the other hand, it's challenging what was more important to me in the time of making the game. 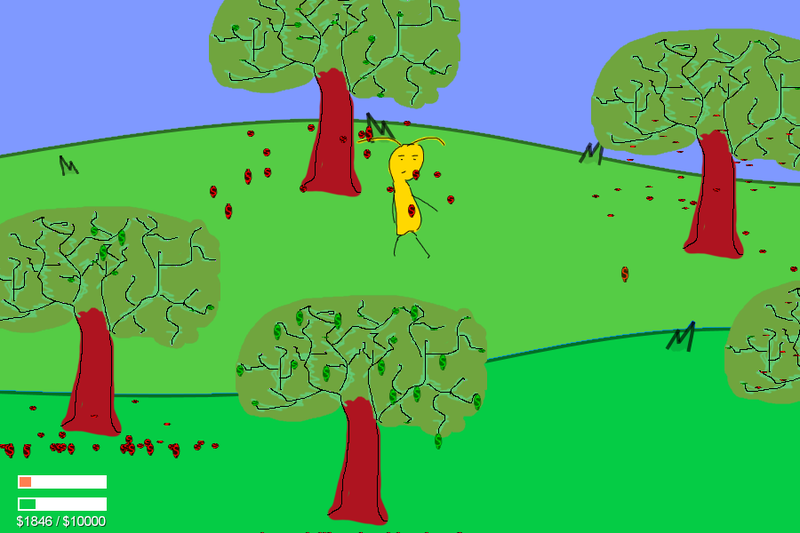 Programmer art done in Paint.NET. Didn't have enough power to make any (even silly) sounds, had to wake up next day to my job (Europe here). I was coding in Java + libgdx + artemis-odb (Entity Component Systems). I had to code some (really) basic renderer , collision detection or camera system so most of components (11 of all 16)  were tech stuff rather than game mechanics. Took some time to partly make a system for dialogs  which actually ended less sophisticated than planned but supports multiline text! Few hours before deadline I actually tried to put some test build on the LD page and noticed that I could embed my game but it's resolution has to be maximum 900x600 - took me another very tiring 2 hours to fix the game so I could have map scrolling and overall camera system at all. In the end I was afraid about rebalancing  the game so I made it little easier (!) than it was before. It all was simple but took time anyway so I finished with less features in the end. That was really one of the latest things I did before final uploading. If you don't want spoilers then just play the game. Otherwise you can take a look at dialog , "thanks" picture  and the code for it .